Manners and Tone of Good Society (1879), the seminal guide to Victorian dining, outlined how to navigate around the vast array of cutlery and serveware in the Victorian age. Touching food with bare hands was not acceptable behavior. So everyone had to learn to recognize all the different accompaniments to the usual dinner service, such as asparagus servers, marrow scoops, and grape scissors. Oh, and you had to know how to use them as well. How do you think you would manage if you sat down to a lovely meal and saw any of the items below? Would you be the toast of the town or commit a gastronomic faux pas? Sugar was brought to the grocer in cone shapes called “sugar loaves.” Mountains and hats were often named after them due to their distinctive shape. In wealthy households, the mistress of the house would cut up the loaf using sugar nippers to break the hard substance into smaller, usable parts for the table. Only the mistress would do this as sugar was expensive and kept in boxes under lock and key. The sugar nips were tongs with a flat surface at the end suitable for lifting pieces of sugar. But they were also sturdy and tough. 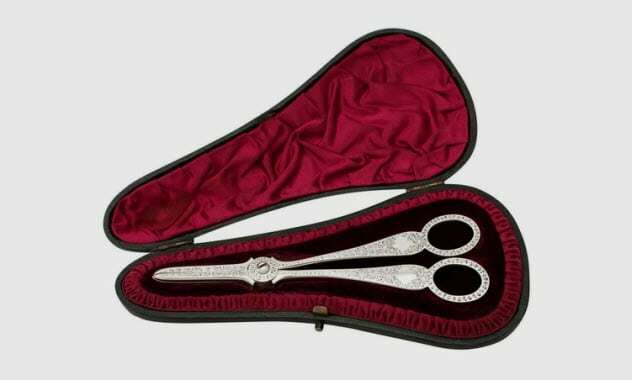 Nips used for cutting were often made from steel, but decorative tongs for table use were often made from silver with elaborate engravings. In Victorian England, the lower classes ate snails regularly. These were affectionately called “wall fish” and were served to locals in pubs like the Royal Oak in Shepton Mallet. Eating snails wasn’t only for the upper classes or the French as most people tend to think today. The snail would be held in one hand, with or without a napkin, and the snail meat would be plucked out of the shell with the other. Delicious! While one might not have made a full living doing so, a man in Bristol in Victorian times known as “Snailer Jack” sold snails as snack food. People would eat them to ward against—or even cure—tuberculosis. They were also reputed to have a particular property that strengthened the lungs . . . but only if eaten raw. Picture this scene if you will. You are a Victorian man or woman at a posh dinner party, and your host’s servants present a glorious roast on the table in front of you. You can’t wait to dig in. But wait! How can you get the delicious marrow out of the bone without offending your host with caveman-like, bone-sucking behavior? A common problem, we know. In this situation, it’s best to handle your marrow scoop with the narrow, elongated end directed toward the bone. Scoop out all the marrow you can, and enjoy the envy of your fellow guests as they are forced to leave their bones on the plate. As identified by the Leeds Museum, the image above shows a marrow scoop from the late 19th century. Marrow scoops from the mid-1700s (which predate the Victorian era) have a longer, narrower shape. Victorian houses were only heated by fires in each room, so the kitchen was often some distance from where the family would actually sit down to eat. As the food was brought to the table, the cutlery would cool down. In turn, this would cause the food to cool faster when it was eaten. To avoid this problem, the Victorians invented the spoon warmer. A vessel, often with feet, was filled with hot water, and the spoons were inserted into the opening. Warm spoons helped to prevent rich and fatty gravy from congealing on the plates. Victorian spoon warmers can rarely be found today. Those lucky enough to spot one might find playful designs such as a snail shell sitting on rocks, an egg-shaped oval on little feet, frogs and fish with open mouths, helmets, or hunting horns. As time went on and homes were better heated, these little devices fell out of fashion. But they remain a delightful reminder of Victorian creativity when it came to dining room etiquette. In the 1760s, the caddy spoon was created as a unique and beautiful accessory for preparing tea in Europe and America. Tea leaves were kept in a tea caddy, a special box designed to keep the leaves fresh and attractively presented. These were often locked at other times as tea was an expensive and precious commodity. A caddy spoon, which could fit inside the caddy, was used to measure out a portion of tea leaves for the teapot. 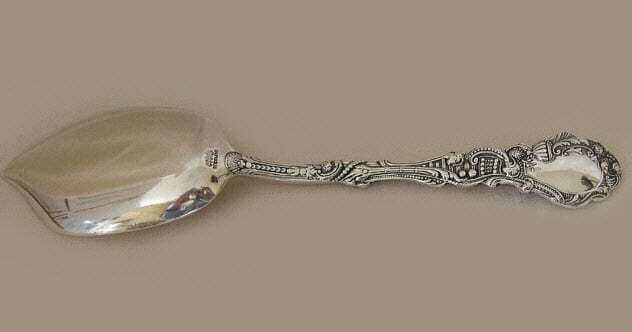 Certain shapes of shells, shovels, or ladles were made by Victorian silversmiths. As time marched into the 20th century, these accessories were decorated with local scenes, crests, or place names particular to the area and owners’ tastes. 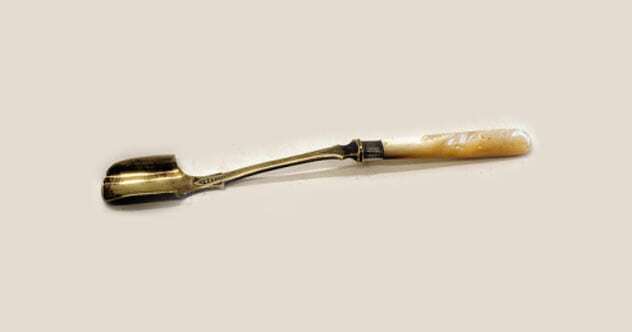 One of the most valuable caddy spoons was sold at auction in 1931 for over £2,000. Designed by Omar Ramsden, his art nouveau spoon was inlaid with semiprecious stones with a knotwork handle. Asparagus was introduced to English society in the 16th century. But it was not until the 18th century that it became a fashionable and exotic addition to meals. 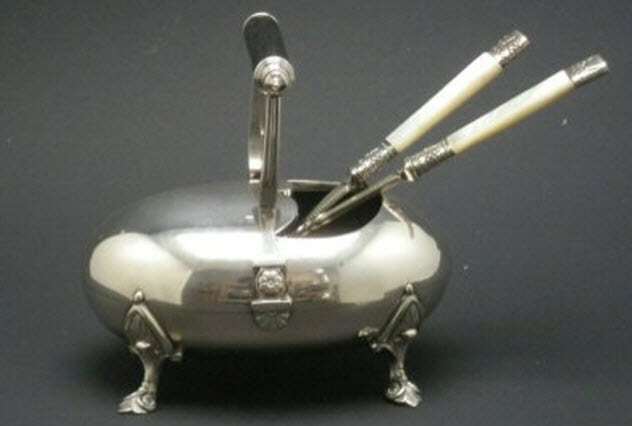 Eating asparagus was the height of elegance and sophistication, so what better to serve this de rigueur vegetable than a pair of asparagus servers? One might wonder what all the fuss was about and why a spoon and fork would not have done just as well. 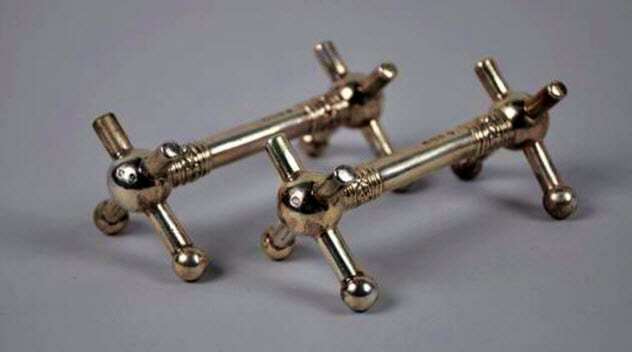 But the Victorians decided that they needed slightly less clumsy apparatus for fine dining. 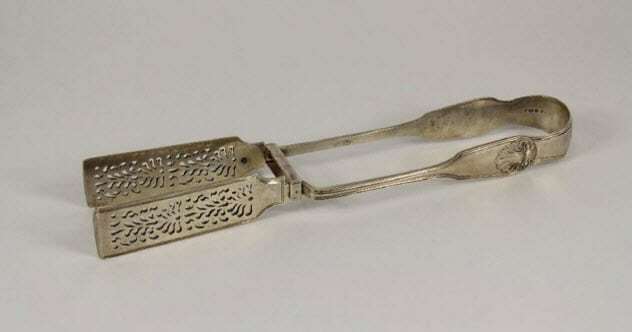 Silver asparagus tongs are a captivating item that reminds us of a more elegant era. They are still quite useful today if you wish to enjoy a spear or two for supper. When our Victorian friends sat down for dinner, there may have been up to 12 different courses! The knife rest was used to keep the single set of utensils clean between courses. 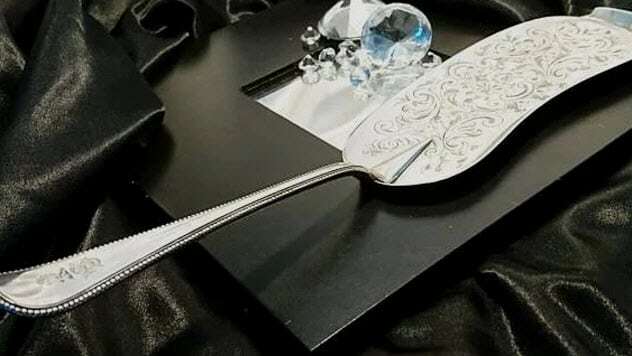 Probably, the knife rest helped to prevent the tablecloth from becoming soiled between courses rather than merely saving the servants the extra trouble of washing more utensils. 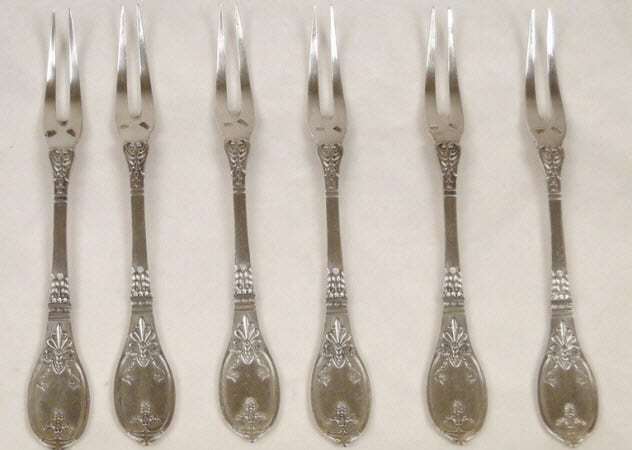 Most households certainly would not have changed cutlery between courses. The first knife rests used at the time of Henry VIII would have been made of wood. But as the Victorians always liked to take things one step further, theirs were made from every metal you can think of as well as crystal and glass, pottery, mother-of-pearl, ivory, and horn. These scissors were often decorated with vines and grape designs as they were used to cut a stalk of grapes in the dessert course. Only then were you permitted to use your hands. In Victorian society, there were only rare occasions when dining etiquette would permit the use of hands at the table—for example, when eating fruit or bread. In a rather clever design quirk, the handles were longer than the blades so that the grape enthusiast could cut deep into the bunch and select the number of grapes he wanted. The blunt ends prevented the fruit from being pierced. 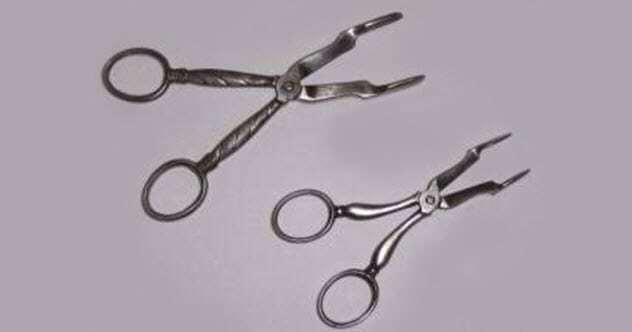 These scissors were made of silver to prevent any tarnishing and to last for many years. The Victorians could not get enough of aspic. For those fortunate few who have not come across aspic, it is a jelly made from gelatin and the stock from meat, poultry, or fish. Other foods, such as eggs or meat, are suspended throughout the mixture. Aspic stopped the meats within the gelatin from becoming spoiled by preventing contact with the air and any lurking bacteria. This was perfect for the Victorians, who had not yet invented refrigeration. An aspic spoon featured a long bowl at one end that had one sharpened side to help cut through suspended, more solid objects in the jelly. The Victorians were a clean and tidy lot who thought nothing was worse than seeing all the crumbs left on the tablecloth following a meal. So they invented the crumb scoop. Arriving in the 1850s, this ingenious device was used by the servants to clear the tablecloth of any meal detritus, including breadcrumbs, salad leaves, and anything else that missed both mouths and plates. 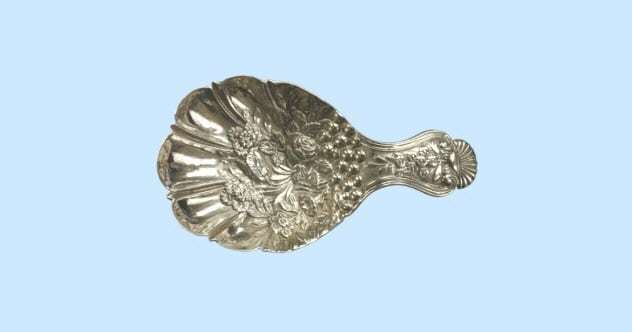 Crumb scoops were commonly made of silver and could be highly decorated with engravings of floral motifs. The scoop handle was made of bone, ivory, mother-of-pearl, ivorine, or wood. Alexa lives in Ireland and loves writing about psychology, sociology, anthropology, and anything historical. Read about more bizarre features of Victorian life on 10 Strange Mourning Items From The Victorian Era and 10 Bizarre Entertainments Of Victorian London.